Hi Folks, I just flew in last night from Cabo and I’m already emmersed into the hurricane here. 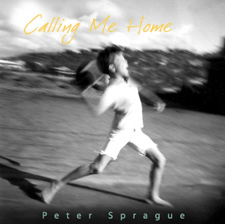 I’m delivering this gig email at the last minute before I head up to play a concert tonight at the new Fallbrook Library. You can’t believe the email traffic jam that occurs when you get away from your computer for a weekthree car pileup at the merge on a Friday evening at 5PM. And just to spice it up a bit, the date happens to be December 23! Ah, but the bliss of being away from computer is an even-keeled world we very rarely know. It has long days of simple thoughts and slow deliberate movements. 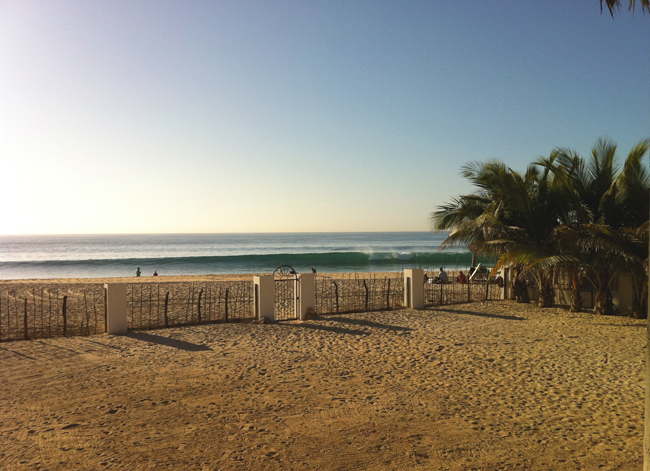 It has 4 foot glassy surf and 73 degree water with a sun that just won’t quit. Mix in some great music moments, cool new friends and some exceptional food and you’ve got a presciption that resets the inner RAM. Reboot and off to the races! This was the setting at our concert at Flora Organic Farms. It is an amazing place a little bit inland from the coast. After driving through the driest desert you come into this oasis of green and beauty. Great folks hang out there too and the food was amazing. What a great show we had! 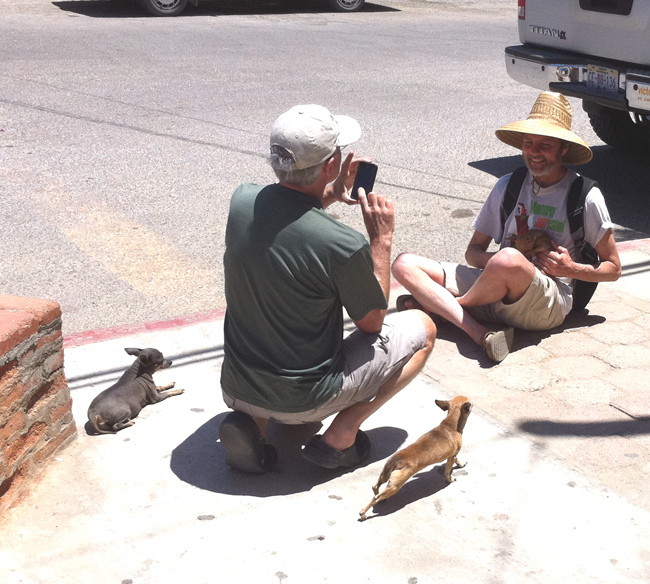 We took a day trip to Todas Santos and here his Tripp taking a picture of me as I hang with some miniature relatives of our dog Rocky. These little dudes we're living the warmth and soul of Baja! 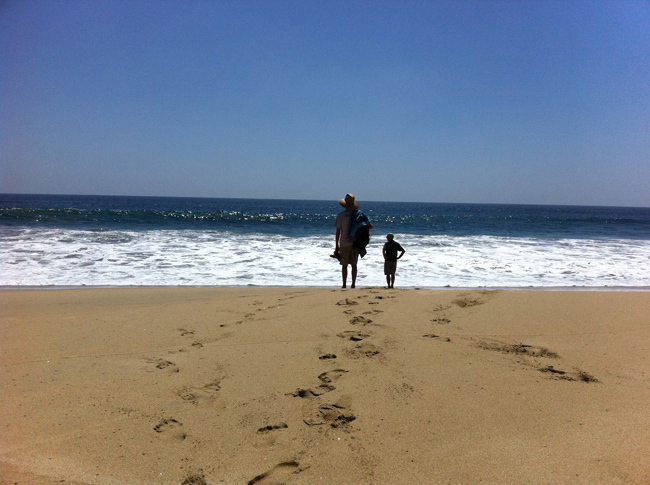 Here's the beach near Todas Santos and it goes on miles and miles each way with white sand, roaring ocean and blue skies. 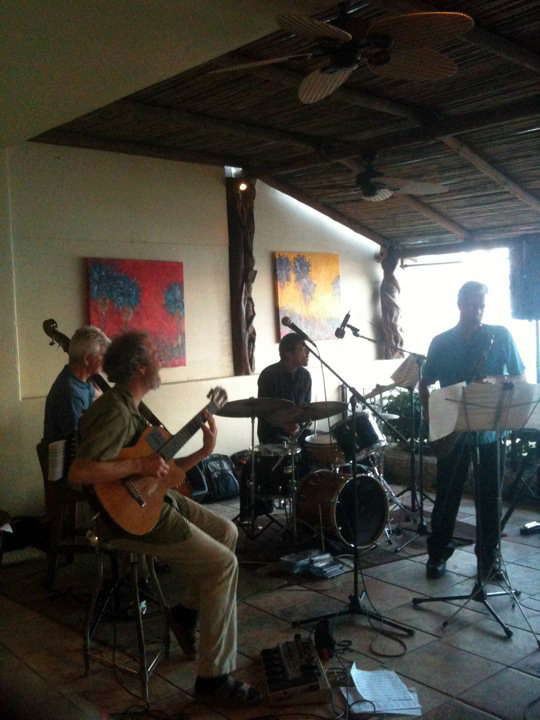 This picture is from the gig we did at the Cabo Surf Hotel. 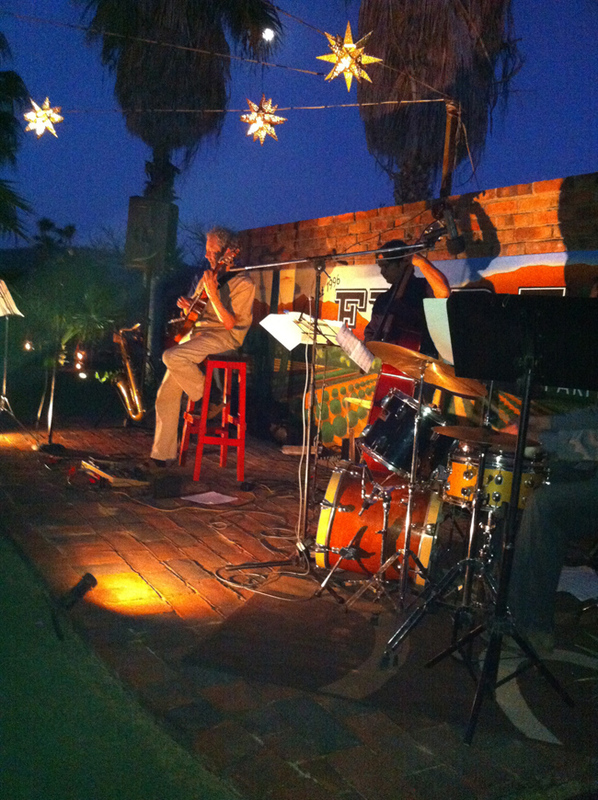 That's Bob Magnusson on the far left, me, Pedro Cervera on the drums and Tripp on sax on the far right. This gig had the added attraction of the full moon rising over the ocean as the sun went down over the mountains. Here's the view right out our window and you can see, the surf was up and we we're on it. Peeling rights with zero wind. 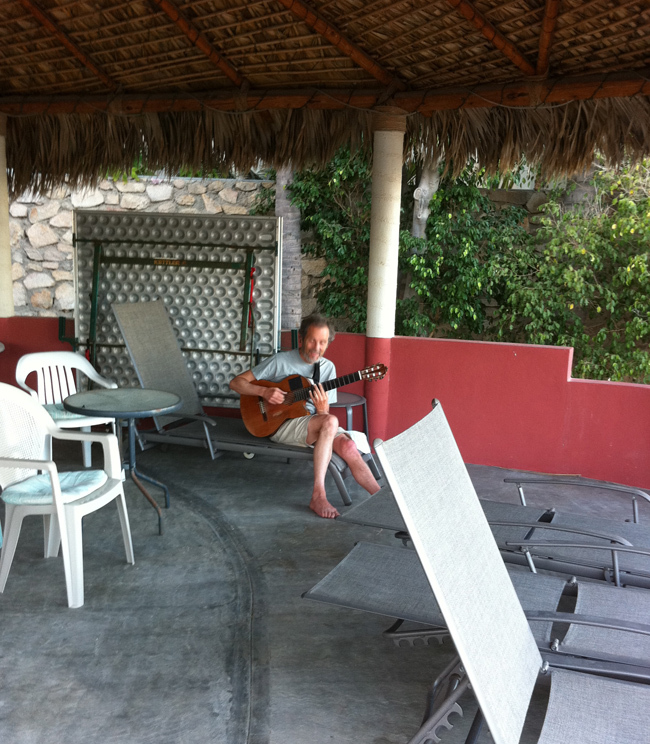 This is my favorite spot under the palapa, practicing and looking out to the surf. Whenever the crowds started to dwindle I'd put down the guitar and grab the board and be out in the water in 1 minute. The tune that I was playing is called "Easy Livin'". Hah! Tonight we play in Fallbrook and tomorrow night we play at the SD Airport in the baggage claim of Terminal 2. For both gigs the band is Leonard, Tripp and myself and we’re ready to take on some new sonic escapades. Look below for the fine print and hope to see you there. On Sunday night Leonard and I are playing a special house concert in the San Diego area and this too should be enormous fun. The details are below! That’s it, gotta tune the guitar and fill up the gas tank and make the trek to be with the good folks of Fallbrook. ps thanks to you all for responding back about the Beatles concert. Great words and good ideas.